I've always believed that if you're going to assume the leadership of an organization—and especially one that's likely to find itself caught up in sticky situations—then you should never, ever shoot the messenger. After all, sooner or later the messengers will stop showing up, and the next thing you know you're reading about the Allied invasion of Normandy in the morning paper. 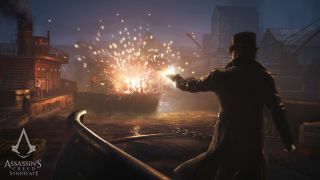 However, judging from this trailer, Crawford Starrick, (the man who pulls London's strings in the upcoming Assassin's Creed: Syndicate), is an adherent of a fairly messenger-shooty school of management. Starrick heads a crew of seven henchmen who control "the pillars of London's society": a banker, a politician, an industrialist, a transport tycoon, a doctor, a mad scientist, and of course an actual criminal. So what's the plan, you wonder? "To free future generations from a city ruled by Templars," of course, a process that will need to be carried out from the ground up: Cut off the legs and the head will fall, as it were. The Syndicate story trailer gives me a different vibe than I've picked up from previous Assassin's Creed games. It's a blend of Brosnan-era James Bond cheekiness mixed with Guy Ritchie-style geezerishness—which doesn't sound too appealing now I type it out, but does give thee game another, somewhat lighter, flavour to previous Assassin's Creeds, which have tended towards the portentous. Or maybe I'm just imagining things because of all the British accents. Assassin's Creed: Syndicate comes out on October 23.